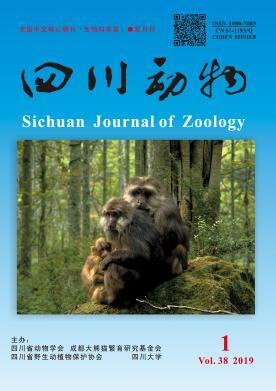 英文摘要：In this study, the full length of the Caspase-7 gene of Dugesia japonica was first cloned using the rapid amplification of cDNA ends technique. The Caspase-7 gene of D. japonica is 935 bp in length, encoding 251 amino acids, and containing 86 bp and 93 bp of the 5'-UTR and 3'-UTR regions, respectively. It also contains 2 key conserved domains of Caspase family, LSHG and QAC(Q/R)G. The three-dimensional structure of Caspase-7 protein was predicted using SWISS-MODEL workspace. The result showed that Caspase-7 protein contains 2 catalytic units and the potential catalytic sites consist of 4 surface rings. The result of phylogenetic analysis reveals that planarian Caspase-7 gene has closer relationship with that of Hydra vulgaris than other species of Platyhelminthes. Quantitative real-time PCR technology was used to evaluate the expression of Caspase-7 gene at different times of planarian regeneration, and the result suggested that Caspase-7 gene might be involved in the regulation of apoptosis in planarian. In addition, knocking down the in vivo expression of Caspase-7 gene by feeding dsRNA interference in the planarian did not influence the regeneration of planarian, but led to a significantly decreased expression of Djclg-3 and PCNA gene, indicating a significantly reduced apoptosis and proliferation. Finally, the regenerative or untreated planarians were dissolving under the starvation condition, and this should be due to the down-regulated expression of Caspase-7, thereby implied that Caspase-7 gene plays a key role in planarian tissue remodeling. 郭素英, 舒瑞阳, 彭建新, 等. 2009. 昆虫中分离与鉴定的caspase及其作用[J]. 应用昆虫学报, 46(5): 678-683. Baguñá J, Romero R. 1981. Quantitative analysis of cell types during growth, degrowth and regeneration in the planarians Dugesia mediterranea and Dugesia tigrina[J]. Hydrobiologia, 84(1): 181-194. Chai J, Wu Q, Shiozaki E, et al. 2001. Crystal structure of a procaspase-7 zymogen: mechanisms of activation and substrate binding[J]. Cell, 107(3): 399-407. Chaudhary S, Madhukrishna B, Adhya AK, et al. 2016. Overexpression of caspase 7 is ERα dependent to affect proliferation and cell growth in breast cancer cells by targeting p21Cip[J]. Oncogenesis, 5(4): e219. DOI: 10.1038/oncsis.2016.12. DeHaan RL, Ebert JD. 2015. Fundamentals of planarian regeneration[J]. Annual Review of Cell and Developmental Biology, 20(1): 725-757. Hill ME, Macpherson DJ, Wu P, et al. 2016. Reprogramming Caspase-7 specificity by regio-specific mutations and selection provides alternate solutions for substrate recognition[J]. ACS Chemical Biology, 11(6): 1603-1612. Hwang JS, Kobayashi C, Agata K, et al. 2004. Detection of apoptosis during planarian regeneration by the expression of apoptosis-related genes and TUNEL assay[J]. Gene, 333(3): 15-25. Jang M, Park BC, Lee AY, et al. 2007. Caspase-7 mediated cleavage of proteasome subunits during apoptosis[J]. Biochemical and Biophysical Research Communications, 363(2): 388-394. Kuranaga E. 2012. Beyond apoptosis: caspase regulatory mechanisms and functions in vivo[J]. Genes to Cells, 17(2): 83-97. Liu PF, Hu YC, Kang BH, et al. 2017. Expression levels of cleaved caspase-3 and caspase-3 in tumorigenesis and prognosis of oral tongue squamous cell carcinoma[J]. PLoS ONE, 12(7): e0180620. DOI: org/10.1371/journal.pone.0180620. Mangel M, Bonsall MB, Aboobaker A. 2016. Feedback control in planarian stem cell systems[J]. BMC Systems Biology, 10(1): 1-18. Martinon F, Tschopp J. 2007. Inflammatory caspases and inflammasomes: master switches of inflammation[J]. Cell Death & Differentiation, 14(1): 10-22. Mead RW, Christman J. 1998. Proportion regulation in the planarian, Dugesia tigrina following regeneration of structures[J]. Hydrobiologia, 383(1-3): 105-109. Park JK, Doseff AI, Schmittgen TD. 2018. MicroRNAs targeting Caspase-3 and -7 in PANC-1 cells[J]. International Journal of Molecular Sciences, 19(4): 1206. Pellettieri J, Fitzgerald P, Watanabe S, et al. 2010. Cell death and tissue remodeling in planarian regeneration[J]. Developmental Biology, 338(1): 76-85. Putt KS, Chen GW, Pearson JM, et al. 2006. Small-molecule activation of procaspase-3 to caspase-3 as a personalized anticancer strategy[J]. Nature Chemical Biology, 2(10): 543-550. Rink JC. 2013. Stem cell systems and regeneration in planarian[J]. Development Genes & Evolution, 223(1-2): 67-84. Rouhana L, Weiss JA, Forsthoefel DJ, et al. 2013. RNA interference by feeding in vitro synthesized double-stranded RNA to planarians: methodology and dynamics[J]. Developmental Dynamics, 242(6): 718-730. Tan TCJ, Rahman R, Jaber-Hijazi F, et al. 2012. Telomere maintenance and telomerase activity are differentially regulated in asexual and sexual worms[J]. Proceedings of the National Academy of Sciences of the United States of America, 109(11): 4209-4214. Thomsen ND, Koerber JT, Wells JA. 2013. Structural snapshots reveal distinct mechanisms of procaspase-3 and -7 activation[J]. Proceedings of the National Academy of Sciences of the United States of America, 110(21): 8477-8482. Wagner DE, Wang IE,Reddien PW. 2011. Clonogenic neoblasts are pluripotent adult stem cells that underlie planarian regeneration[J]. Science, 332(6031): 811-816. Weissman IL. 2000. Stem cells: units of development, units of regeneration, and units in evolution[J]. Cell, 100(1): 157-168. Wolan DW, Zorn JA, Gray DC, et al. 2009. Small molecule activators of a proenzyme[J]. Science, 326(5954): 853-858. Lei B, Zhou XM, Lv DJ, et al. 2017. Apoptotic and nonapoptotic function of caspase 7 in spermatogenesis[J]. Asian Journal of Andrology, 19(1): 47-51. Yosefzon Y, Soteriou D, Feldman A, et al. 2018. Caspase-3 regulates YAP-dependent cell proliferation and organ size[J]. Molecular Cell, 70(4): 573-587.